In Eat! Fat! FIGHT!, (known in Japan as Tsuppari Ōzumō Wii Heya), forget about being healthy! 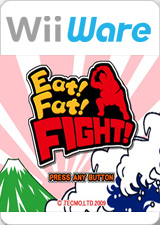 Here's a game that celebrates eating, getting fat, and fighting! Hold the Wii Remote horizontally, and tilt it left, right, up or down to perform all kinds of lifts and throws just like in real sumo. Use all the moves you learn in tournaments around the world to reach the peak of sumo and become a yokozuna! The graph below charts the compatibility with Eat! Fat! FIGHT! since Dolphin's 2.0 release, listing revisions only where a compatibility change occurred. This page was last edited on 1 March 2019, at 04:02.